Available in both capsules and a moisturizing cream, CM Plex supports joint health with a proprietary blend of cetyl myristate, cetyl myristoleate, and other cetyl esters. These compounds have been shown to help increase mobility by penetrating and hydrating the joints relieving joint pain. The cream provides moisturizing benefits, while the capsules supply additional ingredients for internalized nutritional support. Glucosamine AJF (Advanced Joint Formula) features a special combination of natural ingredients that promote joint health and relieve knee pain. Glucosamine stimulates the body’s manufacture of collagen, which holds the joints together and provides a shock-absorbing cushion. In addition, this exclusive formulation includes chondroitin, devil’s claw, and natural cartilage extract. 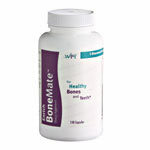 This formulation provides several ingredients that promote healthier bones and teeth. Calcium citrate malate has been clinically proven to help slow down bone loss better than other forms of calcium. Ipriflavone supports bone mineral density, assists the body in slowing bone loss, and enhances the benefits of taking calcium. In addition, magnesium plays a key role in maintaining bone tissue.